York University is a research-oriented public university in Toronto known for its arts, humanities & business programs. Nestled into the landscape on the edge of campus and overlooking a pond and arboretum, the Bergeron Center for Engineering Excellence is a 169,000 sq. ft., five-story LEED Gold facility housing classrooms, laboratory spaces, offices, and flexible informal learning and social spaces. Designed with the idea of a scaleless, dynamically changing cloud in mind, ZAS Architects + Interiors designed an ovoid-shaped building wrapped in a custom triangulated aluminum composite panel (ACP) cladding with structural silicone glazed (SSG) type windows. Costas Catsaros, Associate at ZAS, says the building will help to establish the emerging school by establishing a dynamic, ever-changing identity. 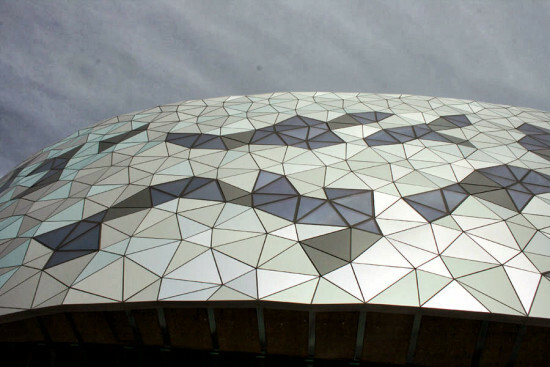 There are two main generators of the Bergeron Centre’s cloud geometry: the building floor plate shape, and various forces manipulating the topology of the cladding surface. The floor plan is designed around 8 curves: a primary curve establishing north, south, east, and west orientations, along with a radius at each corner. Center points of the radii provide reference points for additional sets of geometry and field surveying benchmarks during the construction phase. The resulting ovoid-shaped floor plate, challenged the architects with developing an effective way to wrap the building. They focused on the work of Sir Roger Penrose, a mathematical physicist, mathematician and philosopher of science, whose tessellation patterns inspired an efficient way to generate repetitive patterns using a limited number of shapes. 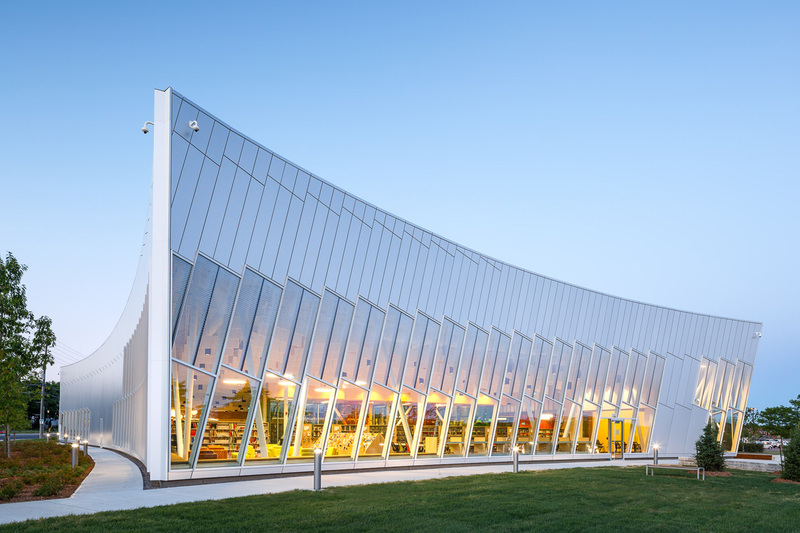 Through an intensive design process, the architects were able to clad 85% of the building using only three triangular shapes, scaled based on industry standard limitations for ACP panel sizes. The other panels were cropped by undulating edge geometry along the soffit and parapet edge curves of the surface. To achieve a dynamic effect, the panels inflect at up to 2” in depth, creating an individualized normal vector per panel. By canting the triangulated panels, subtle variation in color and reflectivity is achieved. Additionally, the architects scattered color-changing dichroic paneling throughout a field of reflective anodized panels, while dark colored panels casually cluster around window openings to blur the perceptual edge between solid and void. The building substrate framing is designed with the complex geometry of the rainscreen system in mind. A modular pre-framed structural unit was developed through a highly coordinated BIM information exchange process which resulted in custom support collar detailing at window openings, a unique two-piece girt system to provide concealed attachment for the ACP panels, and a method to allow for up to 1” of tolerance within the wall assembly through reveal gaps in the cladding. During this process, a design model was passed along from the architects to the structural engineer, who developed a construction model in a 3D CAD Design Software. This model was utilized to generate shop drawings, and shared with the steel fabricator, who shared the model with Flynn, a building envelope consultant, to coordinate the rainscreen panelization with respect to window openings in the building envelope. Catsaros says this was a very successful leverage of BIM technology: "It was a very intense process, but worth it in the end. Laing O’Rourke [general contractor] was able to close in the building a lot faster than if this had been done in a conventional process." Closing in the building early in the construction process was critical on this job, which required an opening date in time for the beginning of the school year in September. This required a peak in construction activity during the middle of winter, which would have presented difficulty on an open job site. The off site production and rapid assembly of the building envelope established a warm dry environment for the installation of sophisticated (and costly) laboratory equipment and building systems, none of which would have been possible with the threat of cold weather and moisture an open building invites.